We propose to evaluate the complication rate in minimally invasive stabilization (MIS) for spine fractures and tumors, as a common alternative to open fusion and conservative treatment. From 2000 to 2010, 187 patients were treated by minimally invasive percutaneous fixation in 133 traumatic fractures and 54 primitive and/or secondary spine tumors. Complications were classified, according to the period of onset as intraoperative and postoperative, and according to the severity, as major and minor. A total of 15 complications (8 %) were recorded: 5 intraoperative (3 %), 6 early postoperative (3 %) and 4 late postoperative (2 %); 6 were minor complications (3 %) and 9 were major complications (5 %). 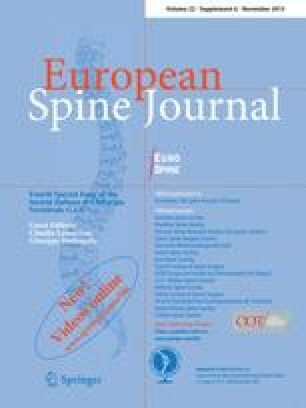 Minimally invasive stabilization of selected spine pathologies appears to be a safe technique with low complication rate and high patient satisfaction. MIS reduces hospitalization and allows a fast functional recovery improving the quality of life. The authors thank Carlo Piovani for image storage and processing and Dr. Cristiana Griffoni for contribution in manuscript editing. Nothing to declare for all authors.